A few days after the announcement, but still worth noting: ‘A Shot of Salt Water’ has appeared on Locus‘ Recommended Reading List for 2015, alongside some brilliant works by brilliant authors who I feel lucky to rub virtual elbows with. 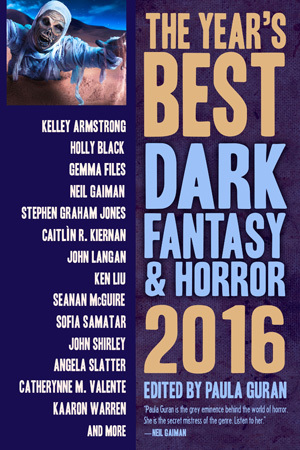 And this news came hot on the heels of another bit of excitement: Paula Guran has also selected a ‘A Shot of Salt Water’ to be reprinted in The Year’s Best Dark Fantasy & Horror 2016, which has an incredible table of contents! (And, for one brief moment, my name rides the coattails of famous folk such as Neil Gaiman, thanks to the happy progression of alphabetical order.) SO great to see friends and other Australian authors on this ToC, too! Tags: dark fantasy, horror, locus, paula guran, recommended reading, short story, the dark, writing, year's best. Bookmark the permalink.